The producer of ökoTech Solar Collectors, Asgard Solarkollektoren GmbH (limited liability company) is located in Graz, Austria. 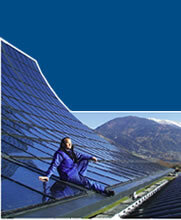 Founded in 1994, ökoTech specializes in the production and installation of thermal solar collectors. For the local market we design, produce and install a wide range of standard solar thermal panels as well as customized solutions for individual customers. For the world market, our focus is on high-performance large flat solar collectors, which we optimize for use in large-scale solar plants. We are experts in engineering special solar thermal solutions and we have a lot of experience in all kinds of on-site installation. Our history of close contacts with end customers and international partners results in solutions which are practical and trouble-free to install. Collectors produced by ökoTech are tested according to EN-12975 and certified with the European SolarKeymark, German Blauer Engel, Austrian Umweltzeichen and listed by Canadian Government. The company also is proud to be the 2010 national winner of the trigos Austrian CSR award. As reference projects, ökoTech is proud to have participated in engineering and producing collectors for some of the largest solar thermal plants for district heating and solar cooling in Austria, Germany, Croatia, Italy, Portugal, other European Countries, USA, Singapore and China. With inquiries about international large-scale projects, please contact our distribution partner GREENoneTEC Solarindustrie GmbH.